The Dutch established a trading post in 1616 25 kilometers up from the mouth of the Essequibo River in what is now Guyana. Dutch sovereignty was recognized by the Treaty of Munster in 1648. The Dutch invited British settlement and by 1760 the British were in the majority. Following a war between Britain and the Netherlands, the French Revolution, and the Napoleonic wars the colonies of Demarara and Essequibo were ceded to Britain by the London Convention in 1814. In 1833 the colony of Berbice was united with Demarara and Essequibo as Brithish Guiana. In 1840 Robert Schombergk surveyed the area for Britain. He determined the limits of Dutch possession and the area from which all trace of Spanish influence was absent. Venezuela insisted that the Essequibo River was the natural bounday between Venezuela and Guyana. In 1899 an international tribunal awarded 94% of the territory to British Guiana, and in 1905 both Venezuela and Britain accepted the boundary. 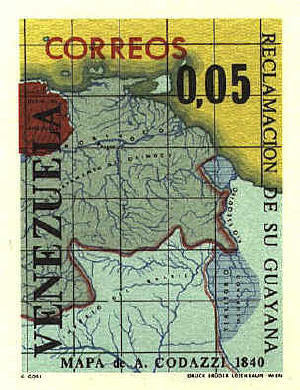 Venezuela renewed its claims in the 1960's. In 1966 Guyana became independent. The protocol of Port-of-Spain which provided a 12 year moratorium was signed by Guyana and Venezuela in 1970, but in 1981 Venezuela refused to renew the protocol. In 1990 the Guyanaese Defense Force and the Venezuelan Army signed a protocol. And that is where the dispute remains. These stamps were also issued both as individual stamps and as souvenir sheets, from which the following images are taken. The map by Juan de la Cruz Cano Y Olmedilla, cartographer to the King of Spain published his Mapa Geografico de America Meridional in 1775. He recognized no British claim at that time. The dark line through the middle of Guyana represents the Essequibo River boundary claimed by Venezuela. The stamp shows a portion of the Mapa coro-grafico de la Nueva Andalucia.... by Luis de Surville. All of the yellow was claimed by Venezuela. By 1802 the English were in possession of the Essequibo region of what had been Dutch Guiana. Jose Manuel Restropo's Carta del departmento del Orinoco o de Maturin, 1827, represents the official Venezuelan position at a time when Venezuela and Ecuador were parts of Columbia. 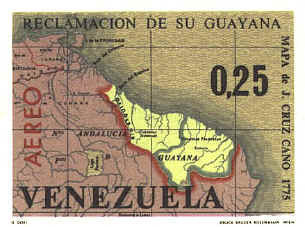 All territory west of the Essequibo River was claimed by Venezuela. 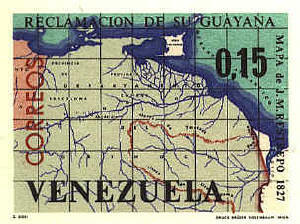 Venezuela also claimed the coastal waters that touched Guyana. The Essequibo River boundary was not acceptable to the British. They would lose a large part of their colony, and the colony would be divided as shown in a design that displays a part of the Mapa politico de la republica de Venezuela in 1840 by Augustin Codazzi. The British continued to advance extended claims, to which Venezuela made various counter suggestions. The map, Sketch Map of British Guiana, 1840. 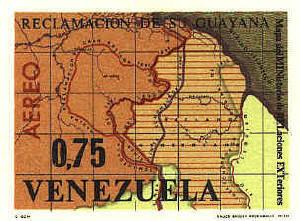 This map appeared on a stamp in 1896, a reproduction of an official Venezuelan map. 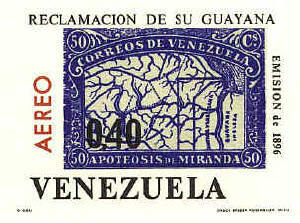 This is the first stamp Venezuela issued concerning the dispute. It was issued in 1896 prior to the awarding of most of the disputed territory to Britain. It showed the Esequibo River as the boundary between Venezuela and British Guiana. The design labled Mapa del Ministero Relaciones Exteriores is presumably a recent map, but it is based on maps dating back to 1835. 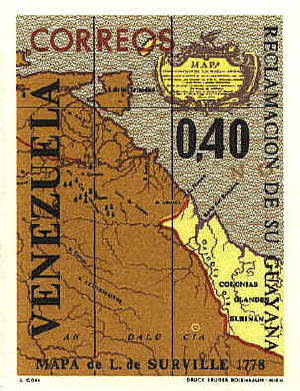 It shows the Linea de Laudo de 1899, the line decided upon by the arbitration commission in 1899, as well as the territory between that line and the Essequibo River claimed by Venezuela. 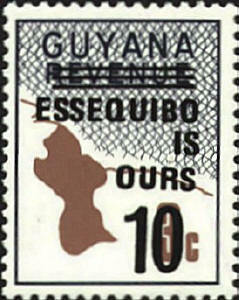 The only issues by British Guyana are overprints that say, "Essequibo is ours."